Last week I showed a study that suggested the 1/18/11 move to new highs on strong volume suggested more upside was likely in the next couple of weeks. Despite a quick initial dip, the market has recovered nicely and is again making new highs. 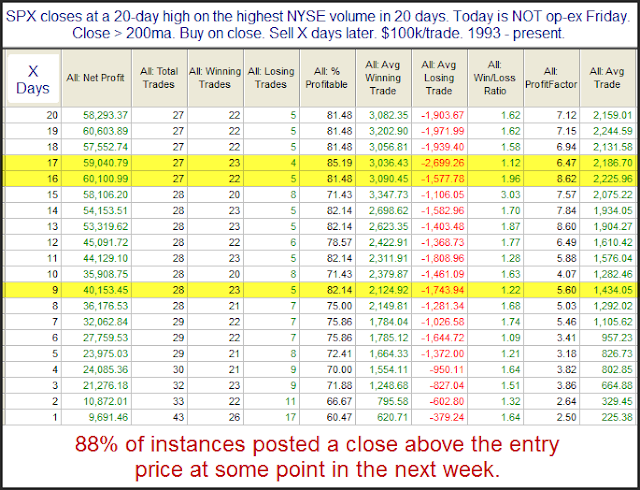 But this time the volume is dropping as we go higher – the last 2 days if you use SPY volume as a proxy. We’ve now had two consecutive 50-day closing highs and seen volume decline both days. This pattern was identified by the Quantifinder and I have updated the study below. The stats table appears to suggest a relatively mild, but consistent, downside edge. The bearish influence is primarily exhausted within the first two days, though. This post is the 6th in the series "Using Quantifiable Edges to your Advantage". In the last two posts I've discussed 1) combining historical edges to develop a market bias, and 2) factoring in overbought/oversold measures to improve risk/reward. So now let's assume you've done those things, and the situation setting up is suggesting a strong directional edge. You've either got an upside bias and a market that is not "too overbought", or a downside bias and a market that is not "too oversold". How do you translate that information into profits? The most obvious way to try and take advantage of this kind of setup is to take on an index position. This is something that I do a lot of, but index trading isn't for everyone and there are many ways to take advantage of a directional market edge without trading indices. 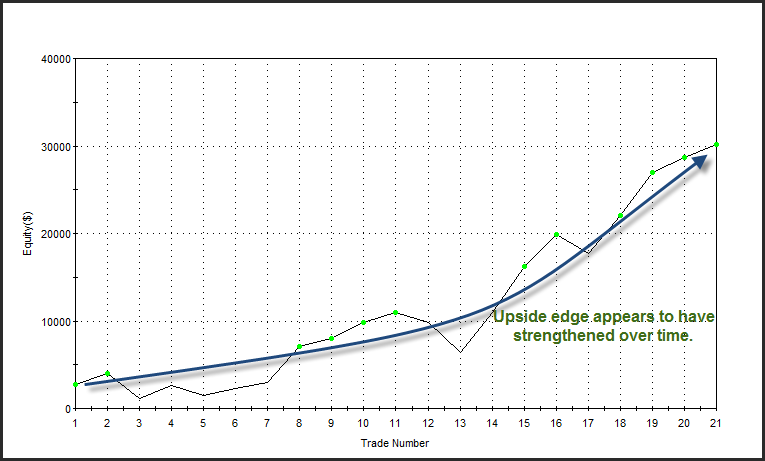 Another way to apply a directional market edge is to favor trades in the direction of that edge. Let's use the example of a systems trader that focuses on either individual stocks or ETFs. Rather than simply take entries that may occur at any time, that trader may elect to use directional market edges as a filter. In other words, if there appears to be a strong upside market edge and one of his short systems triggers, he could opt to ignore the signal or view it as invalid. But if the market edge is to the downside and a short system trade triggers, he could jump on it. In the 10/6/10 blog I showed how I did this for my own systems. I used the Aggregator as a proxy for my market bias. I've discussed the Aggregator on numerous occasions, but if you are unfamiliar or would like a review the embedded link is a good place to start. For my tests I broke out the system performance by times the Aggregator was suggesting a market directional edge in the same direction as the system versus times it wasn't. I found that for almost all of my systems, statistics were substantially better when you were trading with a directional market edge. Times where the Aggregator signal was not confirming the individual system signal, the system simply did not fare as well. But while I've been talking about this using a mechanical systems approach, the concept is applicable to discretionary traders as well. If you are able to identify a directional market edge then you can consistently apply that information in your decision-making. During periods where you expect the market to flourish, you should trade the long side more aggressively and the short side more conservatively. Those times when you determine there is a downside market edge you should take the opposite tack. Trade more aggressively with your short positions and more conservatively with your long ones. At Quantifiable Edges I do my best to try and identify directional market edges for my subscribers. While some subscribers trade indices and perhaps utilize some of the index trade ideas I publish, many of the more astute subscribers simply use the information to enhance the application of their own strategies. A few public examples of this include David Varadi of CSS Analytics and Ray Barros of TradingSuccess.com. On the other end of the trading spectrum from David is Ray. In his December 22nd post, “2010 Adieu” Ray wrote the following, “2010! You taught me many new things. If I had to choose, the Oscar would go to Rob Hanna of Quantifiable Edges. He and I are poles apart when it comes to trading style and timeframes. But through his excellent site and newsletter, he showed me his way of viewing quant studies. I have adapted and integrated his ideas into my own trading with success. Thanks Rob”. But your trading skills don't need to be at the level of these two traders in order to take advantage of quantifiable edges. And you don't need to overhaul your trading strategies either. A simple approach like tweaking your aggressiveness based on your market outlook can go a long way in improving returns. Index traders have long understood how to take advantage of directional market edges. But for those that trade individual stocks and ETFs, my research suggests it makes great sense to take a top-down approach. First determine a directional market edge and then look for those stocks or sectors that are set up best to take advantage of the anticipated market move. By doing this you'll have the market wind at your back and your risk/reward and total profits should benefit accordingly. Just a quick note that tomorrow is a Fed Day. Fed Day's have strong tendencies, though the tendencies vary greatly depending on the environment and the short-term market setup. I have published a large number of studies on Fed Days. If you'd like to review some of them you may check out the Fed Days label page. Or for a more complete compilation, prepare for the Fed Day by reading The Quantifiable Edges Guide to Fed Days. This post is the next in the series "Using Quantifiable Edges to your Advantage". The last post discussed how I combine studies to help establish a bullish or bearish bias. Today I will discuss how I factor in overbought/oversold readings when considering whether to take (or hold) a position. I'm typically averse to maintaining long positions in strongly overbought markets or short positions in strongly oversold markets. Being long in an overbought market, or short and oversold market, can carry a high level of risk since market reversals under such conditions can be sharp. Mean reversion traders strictly abide by this philosophy as they look to take advantage of stretched conditions and then exit once conditions revert to a more normal state. For instance they might look to buy a short-term low and then exit the trade on a moved back up through a short-term moving average. This can be a solid approach, especially if you also factor in the long-term trend of the market. My approach is a little bit different. Rather than comparing the market’s price to a mean or measuring overbought/oversold with an oscillator, I compare recent price action to recent expectations based on estimates provided by my studies. This typically allows me to get long easier if my studies are suggesting an upside bias, and allows me to get short easier if my studies are suggesting a downside bias. At the same time it protects me from entering a position in the direction of a move that is already strongly overdone. Let me provide a brief example to better explain. Assume that over the last three days the estimates from my studies suggested that the market should be up a total of 1%. If over that period of time the market rises 2% then I consider it overbought and too risky to hold a long position, even if my estimates for the next few days are for further upside. But if instead the market has only risen 0.75% while my estimates suggested it should be up 1%, then it would not be overbought and I could continue to maintain my long position. And if my estimates were for 1% up, and the market had declined, there again a long position would be justified. The combination of an underperforming market with positive expectations or a market that has outperformed and has negative expectations is a combination that I want to hold a position. Some recent long signals provide nice examples of instances where a classic mean reversion approach would have to be flat or short, but I was able to maintain a long position. For most of the early December my studies suggested an upside bias. I was quickly taken out of my long position, though, as the SPX became extremely overbought early in the month. On December 15th the market pulled back for the first time in over a week and a long signal triggered. The next day the SPX reversed sharply and closed at a new high. In doing so it would've meant an exit for any classic mean reversion strategy. But despite the new high, the SPX was still considered "underperforming" versus expectations over the last few days. For me this meant I could continue to hold, or even establish new long positions. On the 17th the SPX again closed at a new high, but again it was considered underperforming versus my recent expectations. It wasn't until the 20th when the SPX was making its third new high in a row that my measurement suggested the short-term move up was getting too overheated and it was time to take profits. Even that exit was early as the market continued upward for two more days. My studies remained bullish and my next long signal occurred on December 27th despite the market closing up for the day and only one point shy of another new high. The purpose of this is not to discuss my trade triggers in any detail but rather to share the idea that overbought/oversold can 1) be incorporated to help reduce risk and 2) be looked at a number of different ways. When I determine my position size I consider both the strength of my current open studies, and the degree that the market is overbought or oversold versus recent expectations. While you may not track studies and generate estimates in the same way I do, you should still consider adjusting your overbought/oversold measures based on market conditions and/or your current and recent outlook. These unfilled gaps from high levels often lead to more selling over the next few days. The edge isn't huge, but it appears worthy of consideration. Tuesday’s rally came on the highest NYSE volume in 20 days. This is something I examined in last night’s Letter. One filter I’ve found helpful in the past is excluding op-ex Fridays since they will so often post extremely high volume. Below is a stats table from my examination. These results appear to be very solid for both the short and intermediate-term. I will note that there are a number of short-term studies pointing south right now. These include studies related to SPY patterns, VIX movement, and seasonality. So immediate upside follow through is very much in question despite what’s shown above. But if I see more bullish evidence emerge over the next few days this study could provide a nice start in building a bullish outlook. 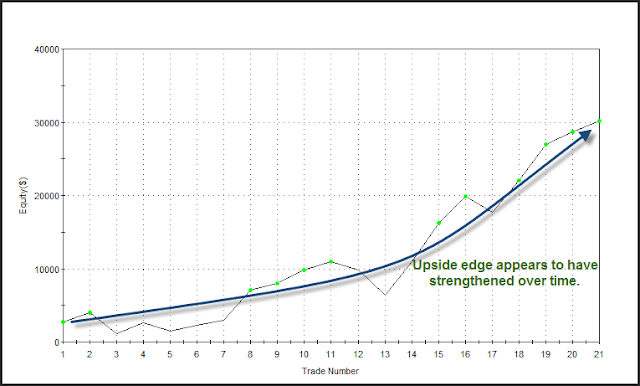 Using QE to Your Advantage Part 4 - Does an edge equal a trade? This post is the next in the series "Using Quantifiable Edges to Your Advantage". The first few posts examined how I lay out the studies, and what I look for when examining results that would make a study compelling. Today I will touch on what it means to have a compelling edge. Does it justify a trade? What if multiple studies appear to contradict each other? First I should say that one of the biggest misconceptions about the studies I post on the blog is that they are market calls. They are not. They simply examine market action or conditions from one narrow perspective. It is rare that I would enter an index trade based on a single study. More often it is a combination of studies that helps provide me the confidence to put capital at risk. I use studies as many traders use indicators. It is rare that someone might see all of their indicators line up perfectly at the same time. Often price action may be suggesting one thing, while breadth, or sentiment, or intermarket action may be suggesting something else. The tool I use to help me weight my studies and determine a market bias is the Aggregator. The basic method of the Aggregator is that it takes estimates from any studies I consider open and active, and combines them into one estimate. A more detailed description of the Aggregator can be found in this post below from 2008. 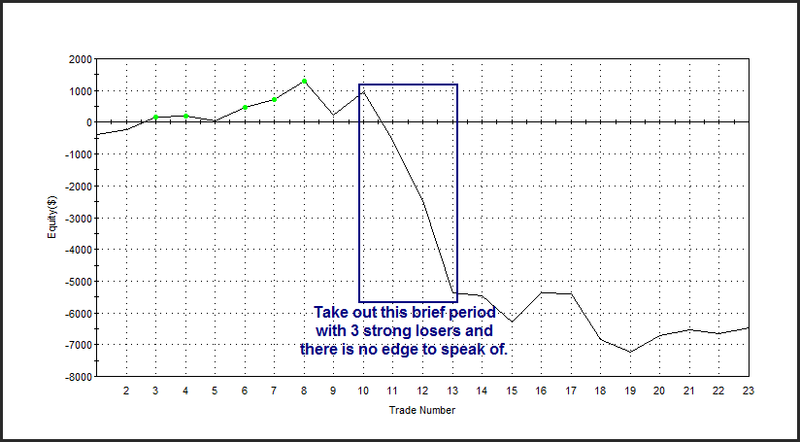 But information about market tendencies that suggests compelling edges are useful for more than just index trades. No matter what securities you deal in, it helps to have a market bias. A bias doesn't have to be formed mathematically, but by taking a reasoned approach traders can incorporate information from Quantifiable Edges, as well as other sources, in helping to establish their market bias. I'll discuss this concept in more detail in a future post. The takeaway today is that a single study is not a market call, but rather a somewhat narrowly-focused examination of market tendencies. It's a piece of the puzzle. A useful piece, but still just a piece. And for my money, even if there is a combination of studies strongly suggesting a directional move, I still need to factor in risk/reward. I also need to consider what would constitute a trigger. My next post in this series will examine how I look at overbought/oversold and the role that plays in determining risk/reward. And hopefully by the end of the series I will be able to clearly demonstrate how narrowly focused studies can be used as part of a solid foundation when building your trading plan…or how experienced traders can incorporate them to improve an already solid trading plan. 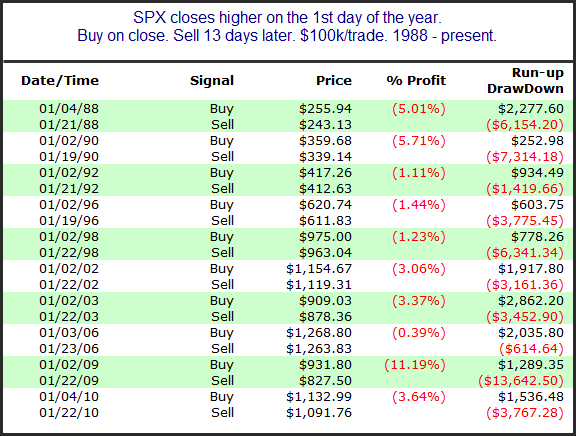 Last year I showed how the SPX has performed after the first day of the year was positive. Often you see a couple more days of upside followed by a selloff. In fact, there has been quite a streak of January dips after strong first days. 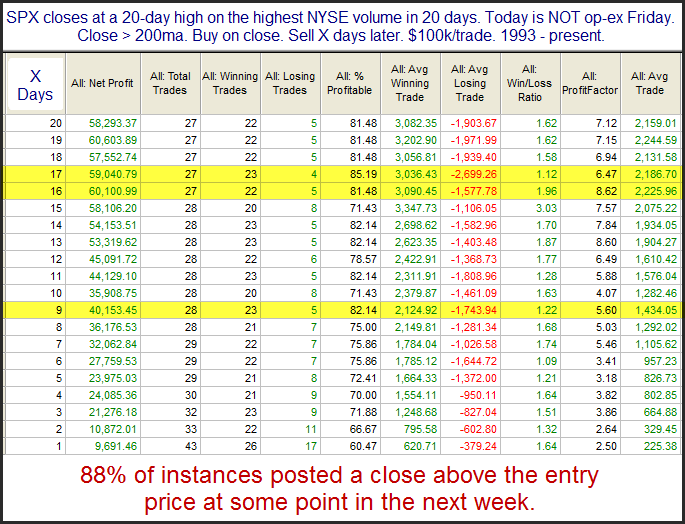 Below are the last 10 instances going back to 1988, and their 13-day returns. Most instances showed a decent amount of runup prior to the market rolling over. In fact the last five instances, starting in 2002 and ending in 2010, all saw the market rise 1%-3% before the move down ensued. Using QE to Your Advantage Part 3 - What Makes A Study Compelling? This post will be the third in the series that looks at using quantifiable edges to your advantage. Today I will discuss considerations I use that help determine whether a study is compelling and whether I want to include that study in my analysis. I will be discussing nine things to consider. I have listed them all below. Average Trade - The average trade column on the results sheet is the first thing I tend to notice. It's the number that's most often used to determine expectations. Strong positive or strong negative numbers in this column would suggest a possible bullish or bearish edge. 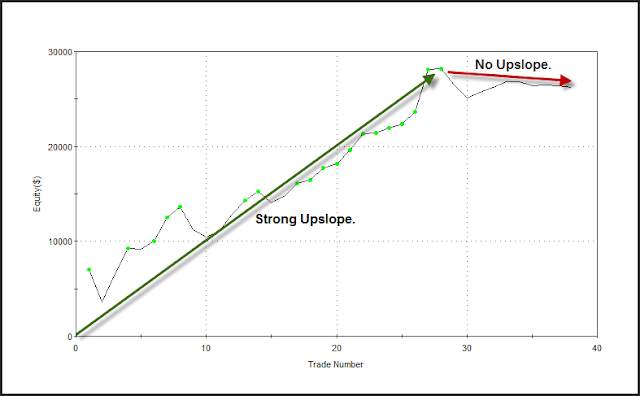 Percent Profitable - Percent profitable helps to illustrate an edges consistency. It is a relatively important number because a high percent profitable suggests the odds of an extended drawdown would be low. As a trader controlling drawdown is important to me so I like to see high numbers in this column for bullish edges and low numbers for bearish edges. Profit Factor - Profit factor is influenced by both win/loss ratio and average trade. It shows how large gross gains are versus gross losses. Here again I want to see high numbers for bullish studies and low numbers for bearish ones. I prefer to see a profit factor of at least two for bullish studies or at least 0.5 for bearish studies. Win/loss ratio - This is probably the ratio I give the least amount of consideration to among those listed. Still it is preferable to see a strongly favorable win/loss ratio when considering a study’s worth. A positive win/loss ratio means you typically have more to gain on a trade than you have to lose. It will give a setup with a 50/50 chance of success (or sometimes worse) a positive expectancy. Equity Curve – The equity curve is a visual representation of how the study has performed over time. It is important to consider for a few reasons. First, you want to see whether the edge has been steady or whether it is recently waxing or waning. Second, you want to see if the apparent statistical edge is the result of a few large outliers. This would suggest that a perceived edge may not be reliable. I could spend a lot of time discussing intricacies, but I think just a few pictures will provide a good idea of what I look for. Below are some equity curves that I have recently run and discussed in the subscriber letter. They are all real curves, but I have erased the setup criteria. This first curve is one that I find especially appealing. When you can draw an arrow from the lower left to the upper right section of the chart and have it never be very far from the equity curve, then that suggests a steady, solid edge. I also find this next curve appealing. The edge is not as steady, but you can see that there has always been an upward slope and that slope has recently increased. This next curve is one that I do not find appealing. While it looked like the setup provided an edge for a period of time, it now appears that edge is either waning or no longer present. This is a setup I may continue to keep an eye on in the future, but would not include it as part of my current analysis. This last curve is an example of one that was heavily affected by a few outliers. When the statistics were generated it appeared there may be a downside edge. A closer look at this equity curve tells a different story. What we see are three big losers in the middle of the curve that account for nearly all of the downside edge. If you take out those three instances, the rest of the curve is just sideways chop. That should give you a decent sampling of things to look for when examining an equity curve. If you're able to find curves that looked like the first one, then you should do very well in identifying edges. I don't commonly show equity curves in the blog, but it is an extra bit of information that I often include in the Subscriber Letter. Timing of instances. Recent or distant history? - You want to look at more than just the statistics and the equity curve. You also want to look at when past setups similar to the one you're examining have occurred. Was the trading environment substantially different then than it is now? For instance, I recently ran a study whose results were very positive and it had a very strong, steady equity curve. But when I looked at the dates I found that most of the instances had occurred in the 60s and 70s. In fact the current setup was the first occurrence since 1996. While the setup looked good from all other aspects, I was wary of including it in my analysis due to the fact that it hadn't triggered in over 14 years. I would much rather rely upon results that have been achieved in the recent past as opposed to results that were all achieved in the distant past. Average and max runup and drawdowns for the trades - I also make sure to note runup and drawdown statistics for each of the setups. This is helpful for number of reasons. Runup stats give me some idea of how much of a move to expect. If the market moves in the expected direction much beyond where a typical runup might take it, then I will often eliminate that study from my "Active List". I do this because any further move in the expected direction is likely due to forces other than that particular study. Looking at drawdown statistics provides further insight into how the market typically reacts to the setup being studied. Is there typically a fast move in the expected direction with little or no drawdown? If so, a move up opposite expectations could suggest the market is sicker than usual. Drawdown statistics are also very useful in helping determine appropriate position size. If the environment is volatile and trades often take a lot of heat before moving in the expected direction, then more conservative position sizing is likely appropriate. Robustness (part 1) – Robust results serve a better chance of performing similar to expectations going forward. Robustness can mean a few different things. One way to test robustness is to see whether a minor change in parameters causes a big difference in results. Ideally you want to see a setup work across a range of parameters. If the parameters are too fine tuned, then the perceived edge may be more a result of data mining and not an actual edge. If a new study is being conducted and the current setup barely qualifies for the parameters being described, then there is a much higher chance that study is not robust. Researchers should strive to ensure the setup they are describing is typical of the sample set that makes up the results, and not an extreme case or an outlier. Of course this isn't always possible, but when a study appears robust and the setup is typical of the sample set, then I have a greater confidence level in those results. Robustness (part 2) – Another way to test if a study or concept is robust is to run the setup across a broad list of securities. This isn't something I typically do with the index studies that I publish on the blog and in the Subscriber Letter. It is something I do when I develop systems. So systems like the Quantifiable Edges Big Time Swing System or any of the "numbered systems" that are available to Gold subscribers are all tested across a broad range of securities. A system that tests well across a broad range of securities, rather than one that is tailored to a specific security, stands a better chance of performing well in real-time. Those are my top criteria when determining whether a study is worthy of consideration in formulating my market bias. In my next installment of this series I will discuss whether an edge justifies a trade, and how I weigh different edges when considering trading opportunities. Happy New Year! Before starting my 2011 posts I thought I would provide a list of Quantifiable Edges highlights from 2010. I have selected below a post from each month of 2010 to serve as a sort of “Best Of” list. There are also a few highlights mentioned beneath that. January – Why I always look deeper than the stats. February – What a weak early tick has led to in the past. I was also involved in a few projects in 2010 that I thought needed mention. John Forman’s Trader FAQ’s – In May John Forman released his New Trader FAQ’s Book. While my contribution was a small one, I was excited to be included in such a top-notch effort. I got word from John recently that a 2nd edition is going to be released soon, so keep your eye out for that! In June I released “The Quantifiable Edges Guide to Fed Days”. This guide was a comprehensive collection of my research on and around Fed Days. I was delighted to have contributions from Tom McClellan and Scott Andrews included in the book. I was also very pleased by the response from those who purchased it. New Guide on Blog – Near the end of the year I started a series of posts focused on “Using Quantifiable Edges to Your Advantage”. The series has only just begun, but I plan on adding to it quite a bit in the New Year. I hope it turns out to be a nice reference guide for new and experience Quantifiable Edges readers alike.